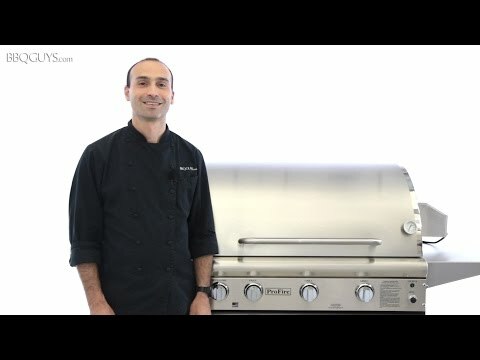 This ProFire Professional Series natural gas grill features two controlled grilling zones with four 11,000 BTU stainless steel burners that push 44,000 BTUs of total cooking power on the grilling surface, and a 11,500 BTU Infra-Roast rotisserie burner. The stainless steel rotisserie motor supports up to 25 lbs. The 16 gauge, commercial grade stainless steel flavor plates are self-cleaning and distribute heat evenly over the entire 525 square inch cooking surface while minimizing flare-ups. The grill is constructed of commercial grade stainless steel, and the double walled hood features a seamless design that is accented with a polished mirror finish. This grill includes rust-free, anodized aluminum SearMagic cooking grids that heat quickly and cook foods at a uniform temperature. These unique cooking grids is reversible. Use the wide, ribbed side for larger cuts of meat for restaurant-style sear lines. Or, flip it over and cook on the smooth side when grilling more delicate items such as fish or vegetables. This ProFire grill also comes standard with a stainless steel smoker tray, dual purpose thermometer, and electronic multiple spark ignitor to enhance your grilling experience. Stainless Steel cart includes one stainless steel fold-down side shelf, access doors for storage, and a 12-foot Natural Gas hose with quick disconnect. Cooking Grid Dimensions 24 5/8 X 20 1/2"
ProFire offers a lifetime warranty on the stainless steel housing, smoker tops, hood, cart, cooking grids, stainless steel burners, heat plates, drip pans, cooking grids, warming racks, gas manifolds and gas valves. The infrared burners are warranted against defects for a period of five (5) years. Cast iron side burners, lights, electronics, and all other components are warranted against defect for two (2) years. When used in a multi-user setting (apartment complexes, multi-family dwelling complexes, schools, hotels, fire stations, police stations, etc. ), ProFire warrants this grill to be free from defects in material and workmanship for a period of one (1) year from original date of purchase. This multi-user warranty excludes restaurants and settings where grill usage is primarily commercial. ProFire is an American-made grill with a durable, 304 stainless steel exterior and a double lined hood which protects it from discoloring. ProFire grills are Modern Home Products' deluxe brand of stainless steel grills. Modern Home Products has an impressive history dating back to 1960 when they introduced the first gas grill. Since then, they've branched out to manufacture multiple grill brands, including ProFire. ProFire's patented SearMagic cooking grids really take your grilling to the next level, and as a chef, what I love most about ProFire grills. They help prevent most flare-ups that the grill may produce. The SearMagic cooking grates are double sided, with a raised side and a flat side. The raised side is awesome for searing steak, while the flat side works well when it comes to cooking smaller, more delicate items like shrimp or vegetables so they don't fall through the grates. The SearMagic grids do a wonderful job at producing even heat, also produce a nice searing heat, wonderful for steak night! Within ProFire, you'll find the Deluxe models and Professional models, with the main difference being stylish curved lid on the Deluxe model that I personally love. The Deluxe also comes with interior halogen lights, which really come in handy for nighttime grilling. When it comes to configuration, you have the option to get a hybrid model which adds an infrared burner, but since the SearMagic grids aren't available within the hybrid, I highly recommend the conventional configuration so that you can experience the SearMagic difference! Please note, you can also get the conventional model with stainless steel rod grids, so be sure to select the option that includes SearMagic grids- you won't regret it! I like that ProFire backs its grills with a lifetime warranty on the stainless steel grill housing, burners & grids, and carries a limited warranty on other parts, including the flavor plates, knobs & ignition system. ProFire makes a nice line of matching outdoor kitchen equipment and a very popular indoor grill as well. When choosing a model that doesn't include SearMagic cooking grids, ProFire isn't the best in regards to even heat distribution and minimal flare-ups. The SearMagic grids really help improve the grill's cooking performance. You want take advantage of the SearMagic difference on a 304 grade stainless steel gas grill that's made in the USA and manufactured by MHP, the company that invented the gas grill. 24 5/8 X 20 1/2" 24 1/2 X 19 15/16" 26 1/4 X 22" 24 X 18"
WARNING: These products may contain chemicals known to the State of California to cause cancer, birth defects or other reproductive harm.